The Bundesliga once again has a magic triangle in form of Luka Jović, Sebastian Haller and Ante Rebić built by Fredi Bobić, who was one of the main protagonists of the original magic triangle between 1995 and 1997. Many Bundesliga fans may still fondly remember a VfB Stuttgart side that was spearheaded by playmaker Krassimir Balakov and the striker duo Giovane Elber as well as Fredi Bobić. The attacking trio hit their top form during the 1995/96 season. That summer VfB Stuttgart signed Bulgarian playmaker Krassimir Balakov from Sporting Lisbon for 2 million Deutsche Mark. Stuttgart won the Bundesliga title in 1992 but had struggled the following seasons. In 1993 Stuttgart finished seventh, a result that was repeated in 1993/94 before spending much of the 1994/95 season in the middle of the table ultimately finishing in 12th place. Experience the amazing atmosphere in the Bundesliga! Book your European football travel now by visiting Nickes.com! Meanwhile, at the top of the table, Borussia Dortmund and Bayern München dominated. Stuttgart were desperate to close that gap and identified Balakov as the key player to get the Swabians going once again. “It was as if the club had signed a missing puzzle piece. Giovane Elber and I had already been at the club for one season. 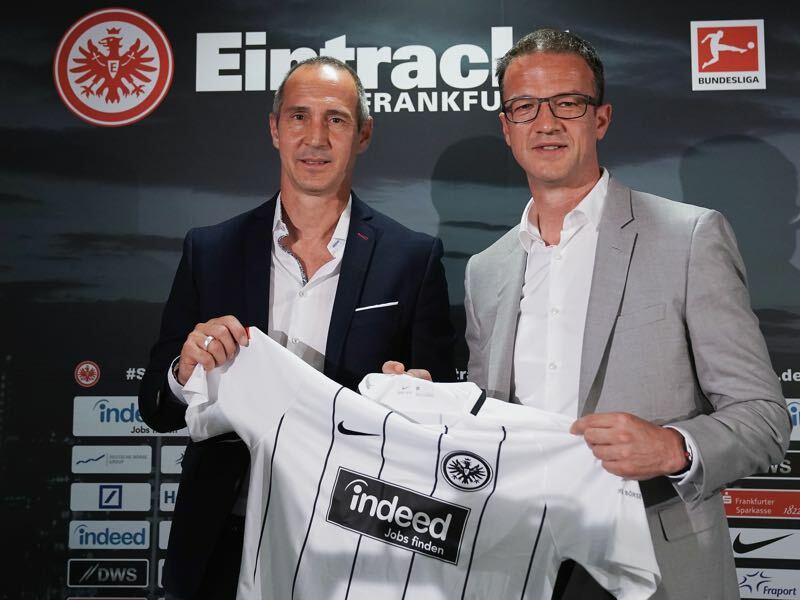 He was an experienced player, who kept an eye on us young guns and was capable of delivering fantastic assists,” Fredi Bobić, who is now the sporting director at Eintracht Frankfurt, told 11Freunde in an interview in 2013. At times it was like magic watching Balakov, Elber and Bobić play together. “Never again did I feel the kind of chemistry I felt with Giovane and Krassimir. We always knew where the other was on the pitch. Even if I let a ball through my legs, I could be sure that one of the two would be there. It was all intuitive, and it was a lot of fun,” Bobić added during the interview. Perhaps the most exciting aspect of the magical triangle, however, was that Stuttgart’s results on the pitch did not improve. In fact, the club once again finished in mid-table. But the football was some of the best the Bundesliga had seen in a long time and games that involved die Schwaben were always spectacular. In the end, Stuttgart would finish in tenth-place with a goal differential of 59:62. Die Schwaben had scored the third most goals in the league behind champions Borussia Dortmund (76), and runner-ups Bayern München (66) but a leaky defence meant that Stuttgart ultimately fell out of European contention. It was a tight league that season and only seven points separated Stuttgart from fifth place Hamburger SV, who occupied the final UEFA Cup spot – although the club would qualify for the UI-Cup where they would finish third in a group of five behind Standard Liege and Aalborg BK. Not that it seemed to matter much to the magic triangle as Fredi Bobić won the goalscoring title with 17 goals ahead of his teammate Giovane Élber, Sean Dundee (Karlsruhe) and Jürgen Klinsmann (all 16 goals). The stage was set for a fantastic 1996/97 season in which Stuttgart managed to overcome their defensive woes to finish fourth and win the DFB Pokal against Energie Cottbus. In that game, Giovane Élber managed two goals in what would be his last game for die Schwaben. The Brazilian striker had scored 17 goals that year and had caught the attention of Bundesliga title winners Bayern München. Joining Bayern that summer he would end up scoring 92 goals in 169 Bundesliga games for Bayern and win the Champions League in 2001. 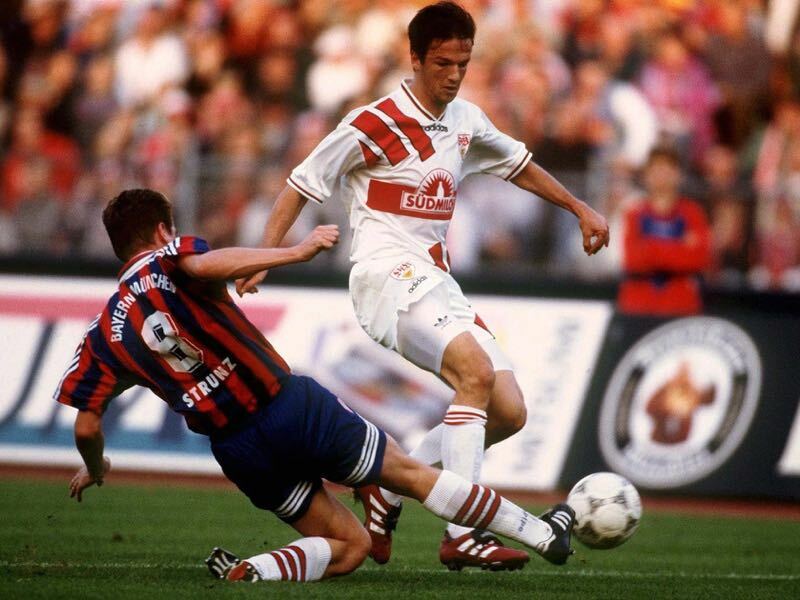 Fredi Bobić, in the meantime, would stay in Stuttgart for two more seasons before he joined Borussia Dortmund in 1999. Bobić, however, struggled at Dortmund as head coach Matthias Sammer preferred Marcio Amoroso, Jan Koller and Ewerthon up front. The striker would then have one last revival at Hannover 96 during the 2002/03 season scoring 14 goals in 27 games. Krassimir Balakov remained the longest in Stuttgart. The Bulgarian maestro played 236 games for die Schwaben between 1995 and 2003 and then became an assistant coach at the club. It was a magic time in Stuttgart that the club has since tried to replicate. In 2007 Stuttgart won the championship but it was a team of a young generation that was spearheaded by talented players like Mario Gomez, Sami Khedira, Thomas Hitzlsperger, Timo Hildebrand, Cacau, Christian Gentner and Serdar Tasci. It was a magic time for Stuttgart but it the club did not possess a magic triangle. That one of its original members would orchestrate the return of the magic triangle. Sporting director at Eintracht Frankfurt since 2016 Bobić has revitalized one of Germany’s biggest clubs. Nicknamed die launische Diva vom Main (the Moody Diva from the Main river) Frankfurt have been a sleeping giant since the 1990s. Last champions in 1959 Eintracht have never won the Bundesliga title (the league was founded in 1963). That is not to say that Eintracht has not come close. In 1992 Eintracht famously lost the title on the last matchday of the season by losing to already relegated Hansa Rostock. After that began a period of stagnation and four visits to Bundesliga 2 (between 1997 and 1999, 2002 to 2004 and during the 2012/13 season). The club almost added another relegation in 2016 but were ultimately saved by Niko Kovac, who guided the club to 16th spot and then defeated Nürnberg in the playoffs. That summer Fredi Bobić was signed to become the new director of sport at the club. Bobić would slowly rebuild the club relying heavily on loan players to improve Frankfurt’s level. Meanwhile, head coach Niko Kovac worked the magic on the field piecing together the various outcasts that his director of sport signed over the last two years. The reward was an excellent 11th place finish in 2016/17 after a season in which Frankfurt fell just short of the European places. But relying heavily on loan players meant that Frankfurt had a high turnover. Not that it mattered Frankfurt improved on their previous season finishing eighth and more importantly managed to beat Bayern in the DFB Pokal final in Berlin ending a 30-year title drought. That victory, in particular, then opened the door to the rebirth of the magic triangle. The pieces were already in place during that final as Luka Jović, Ante Rebić and Sebastien Haller were all in the squad but only Rebić would start with Haller coming off the bench late in the second half. But it took Kovac’s departure to Bayern and the arrival of Adi Hütter to put it all together. Many feared that Kovac’s departure to Bayern would be the end of Frankfurt’s revival. Those fears were further fed when Frankfurt were dismantled 5-0 by Bayern in the DFL Supercup. Then Frankfurt were eliminated by fourth division side Ulm in the first round of the DFB Pokal, and a slow start with just four points from the first five Bundesliga games suggested that this could be a difficult season. 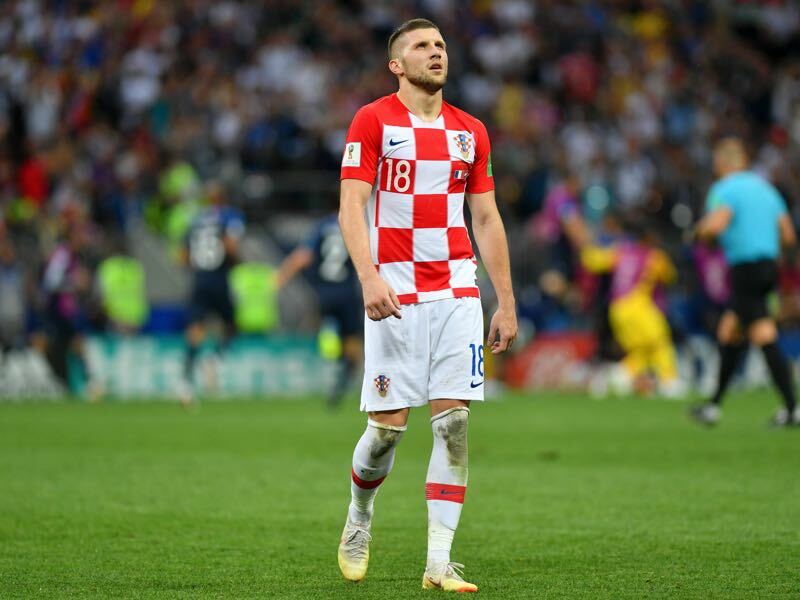 Some of the early season problems, however, were due to Ante Rebić having played at the World Cup. The Croatian forward was one of the biggest shooting stars in the Bundesliga during the 2017/18 season. Remarkable given that Frankfurt had initially sent the striker back to Fiorentina after a difficult 2016/17 season foregoing the loan-to-buy option in his contract. Fiorentina, desperate to offload the Croatian was then willing to once again loan Rebić to Frankfurt with an option that would allow Frankfurt to make the deal permanent last summer for €2 million. Following a fantastic 2017/18 season in which Rebić scored six goals and three assists and was part of a Croatia side that reached the World Cup final his market value catapulted to €30 million. Not surprisingly Frankfurt triggered the option to buy the winger from Fiorentina but what was a surprise that Bobić managed to sign the winger to a new deal that would keep him at the club until 2022 and does not include an exit-clause (although Fiorentina hold a certain percentage of his rights). Rebić, however, missed the first three games of the Bundesliga season and did not start until matchday six against Hannover 96. Unleashed Frankfurt won that match 4-1 with Ante Rebić scoring the second goal of the match. Since then Rebić has scored four goals and two assists in seven Bundesliga games. Among the scorers was also Serbian striker Luka Jović. The Serbian striker is another Fredi Bobić transfer steals. Jović caught worldwide attention when he scored five goals on matchday eight against Fortuna Düsseldorf. The youngest player ever to achieve this trick Jović is currently on loan from Benfica but Frankfurt can make the deal permanent for €6 million. His transfer was only possible after Jović failed to make an impact at Benfica following a complicated transfer from Red Star Belgrade via Apollon to Portugal. Fredi Bobić, however, was willing to take a risk on a striker, who just a couple of years ago was considered among the most talented in Europe. It was a risk worth taking as Jović has scored nine goals and three assists in nine Bundesliga games and three goals in four Europa League games. A little risky was also the signing of French forward Sebastien Haller. Brought in from FC Utrecht in the summer of 2017 the striker scored 13 goals and six assists in 32 Eredivisie games. On a first glance not a bad goalscoring rate but Haller was on a downward trend as the striker had scored 17 goals the previous season and as a result, Fredi Bobić ended up paying just €7 million for the forward. Again it was money well spent. 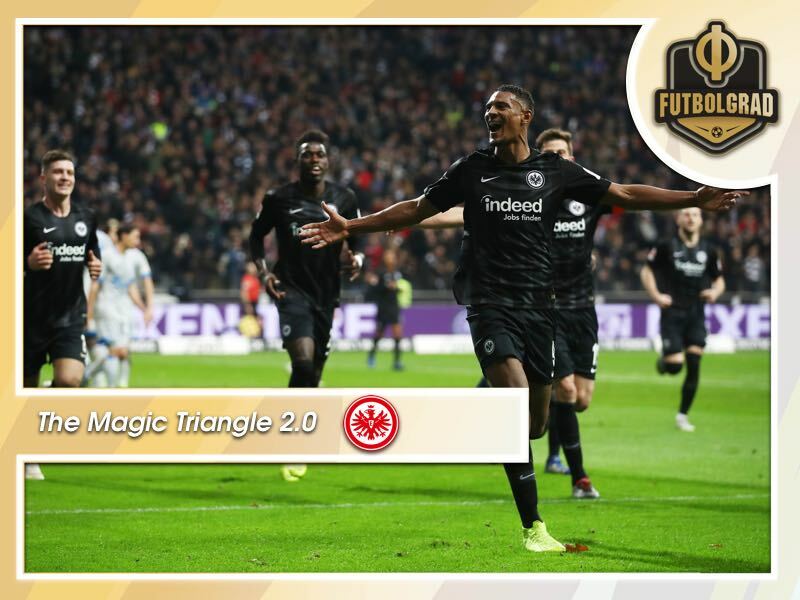 Haller scored nine goals and four assists last season in the Bundesliga, and his three goals in four DFB Pokal games were vital for Frankfurt to reach the final in Berlin. Furthermore, the striker has made another big step in his development this season by scoring eight goals and five assists in eight Bundesliga games and two goals and two assists in four Europa League games. This year the three of them have been on fire. The trio of Rebić, Haller and Jović have scored 21 of Frankfurt’s Bundesliga goals by matchday 11. Only Lionel Messi, Luis Suarez and Coutinho at Barcelona as well as Kylian Mbappé, Edinson Cavani and Neymar at Paris Saint-Germain have scored more goals than Frankfurt’s attacking three in any of Europe’s top-five leagues at this stage. Unlike the expensive trios at Barcelona and Paris, however, Fredi Bobić managed to sign his attacking lineup for just €9.2 million (15.2 million once Jović’s clause is triggered). “All those transfers meant a lot of work. And you need plenty of imagination to complete such deals,” Fredi Bobic told the German magazine Focus. The sort of imagination perhaps that Bobić showed on the field as part of Stuttgart’s magic triangle. Speaking of that magic triangle, Frankfurt’s current attacking trio is often compared to the Stuttgart side Fredi Bobić played for in the 1990s. In reality, however, Frankfurt’s magic triangle was not fully unleashed until matchday 10 when the three started against Bobić’s former side VfB Stuttgart. In that game, Haller and Rebic would score the first two goals with Jović providing the assists to either goal. The three were then once again separated in Frankfurt’s 3-2 win over Apollon in the Europa League as Hütter opted to not start Rebić from the beginning. Then on matchday 11 against Schalke, the trio was once again roaming together in the attack with Haller and Jović scoring three goals between them and Rebić providing an assist. Those last two Bundesliga games, in particular, have led to suggestions that Fredi Bobić may have built a new magic triangle in Frankfurt. There are, however, significant differences. Unlike the original version in Stuttgart Frankfurt lack a true playmaker. Ante Rebić, who has been moved to a false-nine/number 10 position by Hütter is not a midfield maestro. Instead, the Croatian is more like a icehockey power forward. Rebić likes to pick up the ball deep and steam forward create chaos among defensive lines while at the same time creating space for his attacking partners. In some ways, he is the anti-maestro and the anti-matter to the classical Raumdeuter, while at the same time fulfilling many of those roles. It is indeed fascinating to watch as Rebić win the ball and steams forward creating opportunities. His partners in crime in the meantime have more in common with the original trio. Haller like Bobić is the sort of striker that could hold the ball and allow his fellow forwards to join the rush. Jović, in the meantime, has been favourably compared to Colombian forward Radamel Falcao. Among the three Jović is the most complete and talented and will likely have a similar career path to Giovane Elber. Together the three have produced 33 scorer points this season and only in 1993/94 did Frankfurt score more often at this stage of the season (30 goals as opposed to 26 goals this season). In other words, Fredi Bobić has created the potential for something special in Frankfurt, but unlike his original magic triangle, Frankfurt have plenty of potential behind the top three with the likes of Mijat Gaćinović, Nicolai Müller, Filip Kostić and new signing Goncalo Paciencia all with potential to chip in goals. Hence, while it is fun to remember the original magic triangle and draw parallels the differences are somewhat significant. That is not to say that this is not special. 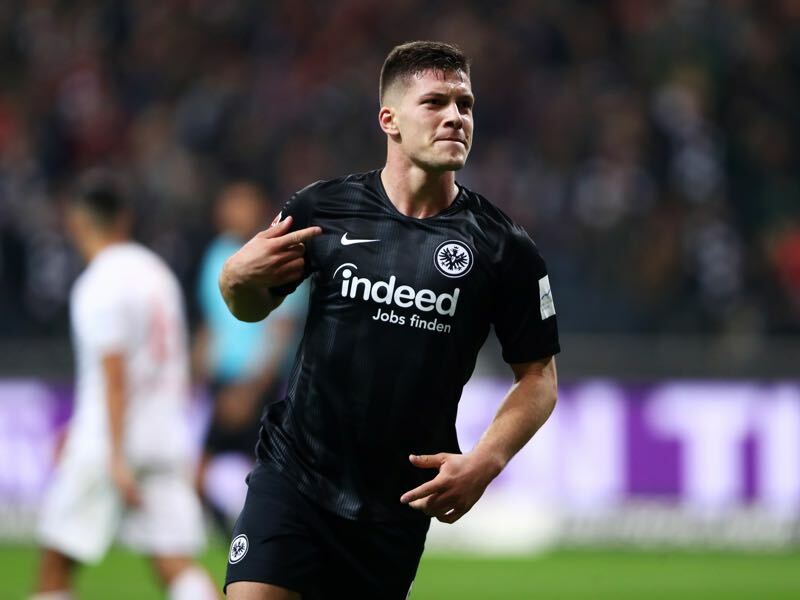 Because it is Frankfurt have the potential to challenge for the top of the table this season seriously should the trio of Jović, Haller and Rebić continue to fire out of all cylinders. It would be a magic triangle 2.0 fittingly created by one of the protagonists of the original: Fredi Bobić. Oleg Kononov – Is he the right man for Spartak?